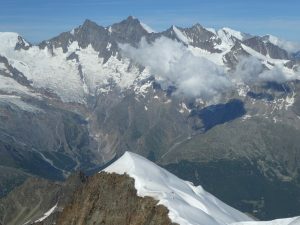 The Weissmies is an easy 4000m peak across the Saas valley from the Dom. The current normal route is a glacier climb from the west, aided by a tram from Saas Grund. 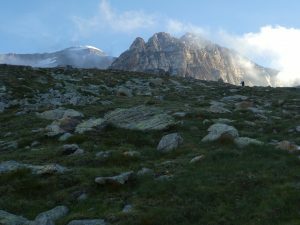 Before the tram, the normal route was the easy south ridge, a class 3 climb from Saas Almagell with almost no snow travel. This route requires a fair amount of elevation gain — about 2300m — though less than the routes I had done the previous two days, and it was about right for me in my tired state, taking six casual hours and change round-trip. I slept unmolested in the affordable (only $5!) Saas Almagell car park, and took off around 5:45. I was not sure what to expect of the route snow-wise, so I took my ice axe but left my crampons behind. This turned out to be the right choice, as there was a solid boot-pack on the small mandatory snow traverse on the summit ridge, and I could boot-ski the snowfield next to the ridge on the way down. I made my way through a bit of a trail maze to the Saas Almagellalp restaurant, then took one of two trails up to the climbers’ hut. I saw a man ahead of me, and slowly made up ground, catching him just below the hut. He asked me what route I was doing, and mentioned that he was taking another way up, planning to descend the south ridge. He had trekking poles and light boots, but did not seem to be carrying an ice axe, and seemed to know what he was doing. I passed a woman in approach shoes above the hut, who I assumed was doing the south ridge like me, but who was apparently just out for a hike. The trail continues past the hut, to the Zwischbergenpass, one of two high passes in the area leading east to Italy. From there, the route follows the obvious south talus-ridge. Lower down, it is just a boulder-hop, though it steepens toward the summit. I found some class 4 steps, but I could probably have avoided them and kept everything class 3, with most just a class 2 walk. Near the top, I passed a couple of guides with their clients, out for a roped hike. Watching them made me want to slap my forehead, because I could not imagine a scenario in which having the rope on would make a difference. Tripping in talus can definitely hurt, but it seems impossible to fall in a way that a rope could catch. It would have taken a running jump to actually fall off the ridge in a way that the rope might help. The final couple hundred yards follow a gentle snow bulge to a rock summit, which is slightly shorter than a nearby snow crest. I passed some people on the rock to tag the true summit, watched some people below on the west glacier route, then returned to the rocks to get out of the wind and eat my sandwich. It was cool in the breeze, but otherwise a clear and pleasant day, with excellent views of the higher peaks from Monte Rosa to the Dom. Lunch done, I retraced my steps, passing another roped party on the ridge, then dismounting to plunge-step and boot-ski down the snow-slope to the east. There was quite a crowd at the hut, but I passed without stopping. I would have run most of the descent if I were fresh, but I was tired and had nothing to do the rest of the day, so I settled for a brisk walk, returning to town just after noon. The Saas Almagell tourist bureau did not seem to have WiFi, so rather than hang around, I got the heck out of Switzerland via the Simplon Pass. I will be back for the Bernese Alps, but I needed a break from the buttoned-up, stressful country.